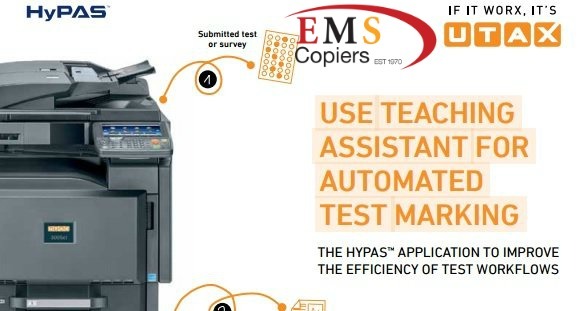 Teaching Assistant an automated marking application is available on all MFP’s from EMS Copiers. Streamline the task of printing, grading and analysing multiple-choice tests with Teaching Assistant. Creating test sheets, asking students to take the test and then spending hours grading each test at the end of a topic or syllabus is hugely time consuming and means teachers and trainers can sometimes spend more time marking papers than planning their next lesson. With Teaching Assistant the UTAX MFP from EMS does all the hard work in a matter of minutes! Meaning teachers/trainers can concentrate on the students and lesson plans rather than time-consuming, manual test marking. Teaching Assistant not only prints out the bubble test sheets and answer key, it then grades the completed tests and provides graphical class data. This data includes response frequencies, test scores and the hardest and easiest questions. Not only that, but teachers can also print out the individual test papers with the student’s overall grade and any incorrect answers circled with the correct answer next to it. Teaching Assistant is not only valuable within education, it can assist numerous areas and industries where surveys and testing is a regular occurrence.